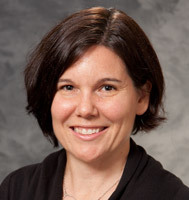 Dr. Barroilhet is the Dolores A. Buchler, MD, Faculty Fellow in Gynecologic Oncology and an Assistant Professor of Medicine at the University of Wisconsin School of Medicine and Public Health. She completed her four-year residency in obstetrics and gynecology at University of North Carolina-Chapel Hill. After finishing her residency in 2009, she began her three-year clinical and research fellowship in gynecologic oncology at Brigham and Women's Hospital in Boston, Massachusetts. She holds board certification in Obstetrics and Gynecology. Dr. Barroilhet joined the UW Carbone Cancer Center in 2012, her interests include minimally invasive surgery, healthy lifestyle modification and survivorship. Her primary research interest is drug development. She is the leader of the Disease Oriented Work Group for Gynecologic Malignancies, which reviews and prioritizes clinical research activity, and provides ongoing planning for new investigator-initiated studies. Dr. Barroilhet has published in numerous peer-reviewed journals and has been active in presenting research at national conferences. She has been recognized with multiple awards by her peers for exemplary teaching of residents and staff as well as patient care.